Sew Mama Sew GiveAway Day!! Yippee Yay - It's Sew Mama Sew Giveaway Day!! A big welcome to anyone visiting my blog for the first time, and always a big hello to my regular visitors. It's like giveaway city around here, with my previous post as a giveaway too, pop back and check it out. I'll keep this brief because I know there are zillions of givaways to visit. I've got 2 prizes for 2 lucky winners. ...and other bits and pieces from Tula's earlier ranges. 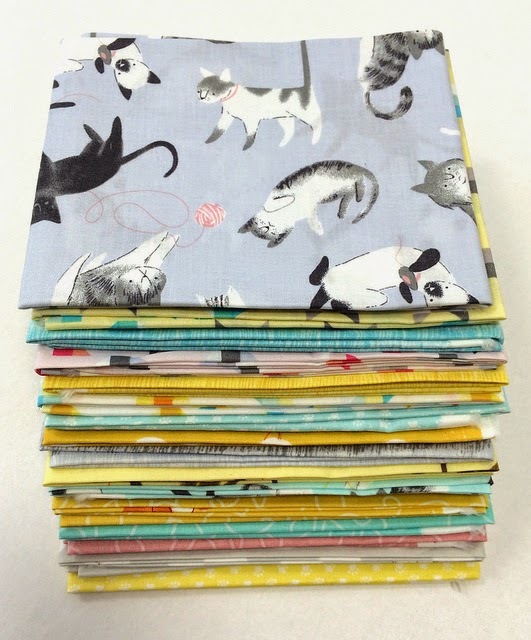 For a second winner - a fat quarter bundle of the cutest cat fabric that ever there was. Okay, here's what you have to do to win one of these fabulous prizes. Answer this simple question: What is your favourite fruit? And for fun if you are a wonderful follower you can have 2 extra comments, that's 3 in total for followers! I'm happy to ship any where in the world. The winners will be picked randomly on Saturday 13th December at 5pm, Blue Mountains/Sydney, Australia time. Normally I try to reply to comments but it's going to be a busy week of getting around to giveaways so I'll say a big Thank You now for visiting my blog and taking part in the fun. And an extra big thank you if you become a new follower. Ps. For more giveaway fun visit my previous post where I have 2 copies of a totally awesome new quilt book, Cultural Fusion Quilts to give away. **This Giveaway is now closed - Thank you to everyone for all your wonderful fruity comments. They made me want to eat fruit salad all week long. Thankyou for this lovely giveaway Racheal i am a happy follower and i also like grapes. Great giveaway, you rock! Hard to pick just one favourite fruit so seeing I get three entries as I'm already a follower I'll start with mulberries fresh from the tree, if only I had one! My next favourite fruit is watermelon! My other favourite fruit is mandarins! Thanks for the giveaway! Some kind of berry, any berry! I do love a peach, but without the fuzz please! Blueberries are also wonderful, especially with peaches. I also enjoy raspberries. And again they are great with peaches. Thanks for the fun giveaway! I love fig's very much! And in summer I am fond of watermelon, yay! Thanks for three chances! My favorite fruit at the moment is figs, love them! I love that fabric by Tula Pink but have not seen it anywhere around here! Have you made anything with it? I would follow you to the moon and back but mostly do on bloglovin! I also like strawberries, grapes and bananas but not as much as carambola. What a lovely giveaway. My favourite fruit is mango. My favorite fruit is passim fruit. Thank for the chance to win some beautiful fabric. I think I like grapes best. ...now the third fruit is a challenge..hm...canned peaches straight from California , does that count ? And bananas :) Thanks for a great giveaway! I love watermelon the best! Hi Racheal - gorgeous giveaway - my favourite fruit would be watermelon. annnnnnddddd Oranges! And roasted Pineapple! My favorite fruit is banana. Follower second entry. Love those kitty prints! My all time absolute favorite fruit is the apple. My favorite fruit is mango! 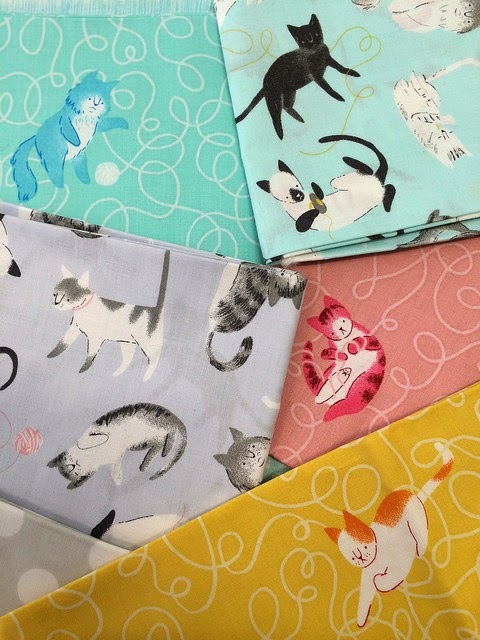 Lovely fabrics, love the cats! Thank you for the chance. I follow along on feedly and I also like black berries! What goes great with pineapple? Banana! I love pears. Can never walk by without buying one. I'm a faithful follower with Bloglovin. My favourite fruit is watermellon. 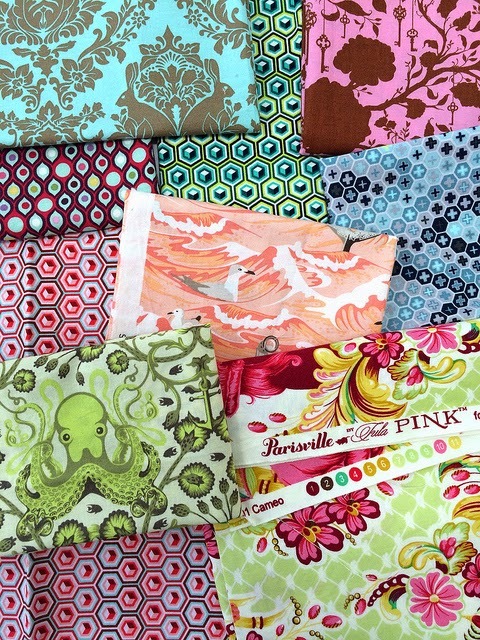 I love Tula Pink and don't have these fabrics because I started collecting after they came out. Good morning from Minnesota. And wow-Great giveaways!! As for my favorite fruit, it would have to be pineapple. Yum! Wow! What an amazing prize!!! My favorite fruit is cherries! I like all types of fruit, currently though cantaloupe is my favorite but I will never say no to strawberries especially chocolate covered strawberries! Gosh what great giveaways. It would be easier for me to say which fruits I don't like as they are all pretty wonderful. My favorite has to be berries--raspberries. And I'm a follower and also love blueberries. And finally, I do love cherries too! Thanks for the 3 chances! Watermelon - but it has to be seedless! 2nd fav fruit would be strawberries - love to make smoothies in the summer! And 3rd would be bananas to mix with the strawberries for the smoothies! Berries! Strawberries and blackberries. MMM! Thanks for the great giveaway. I love me some passion fruit! I love fruit, especially watermelon and raspberries. Apples are my favorite. Thanks for the chance to win! I especially like the Tula Pink fabrics :). What a great giveaway! My favorite fruit is cherries. Thanks for the chance! Cat fabric! That is sooooooo cute! I think my favourite fruit are strawberries -- especially our local ones when they are in season. I'd love to win some fabric for my birthday which is in fact on the 13th. I follow you on bloglovin. My favorite fruit is mango. Hi Rachael, thank you for this great GiveAway!! I follow you with heart on bloglovin! My favorite fruit are cherries!!!! My favorite fruit is a perfect clementine! I'am a happy follower dear Rachael! I love mangos and cat fabrics. I really love cat fabrics. I also love strawberries and cat fabrics. Ummm... Strawberries with icecream Yum! I like to try my luck! Been following on bloglovin for a long time. Thanks for the tutorial on swoon houses. I've been making potholders out of them for gifts. My favourite fruit is strawberries. Raspberries can never have to many of them. I need a banana everyday but I think my favorite fruit is watermelon. I would have to say pomegranate. Such a pain to eat but so worth it :). I like apples the best! I tasted dragonfruit in Vietnam and I think it was my favorite ever. I really like watermelon but also pretty much all fruit in general. I started following you on Bloglovin. I'm excited to see what you post! I follow your blog with Bloglovin. Another entry for following. Thanks for the amazing giveaway! Hi there! What a great giveaway! The best thing about summer is watermelon. A fruit that comes with its own bowl! Thanks for such a generous giveaway. All of those fabrics are beautiful! I follow on Bloglovin and love your blog. You are so creative! It just gotta be strawberries - salad, desert or by themselves with whipped cream. I just love cats. I just adopted a new kitty. She is a tri-colored and her name is Bella. Thank you for being a part of the Sew Mama Sew giveaway and the chance to win - fabric, of course. My favorite fruit is melon! WATERMELON! Love love love watermenlon. I follow through blogger or GFC..not sure which is which I know I see your feeds in my blogger but at the side it says GFC. 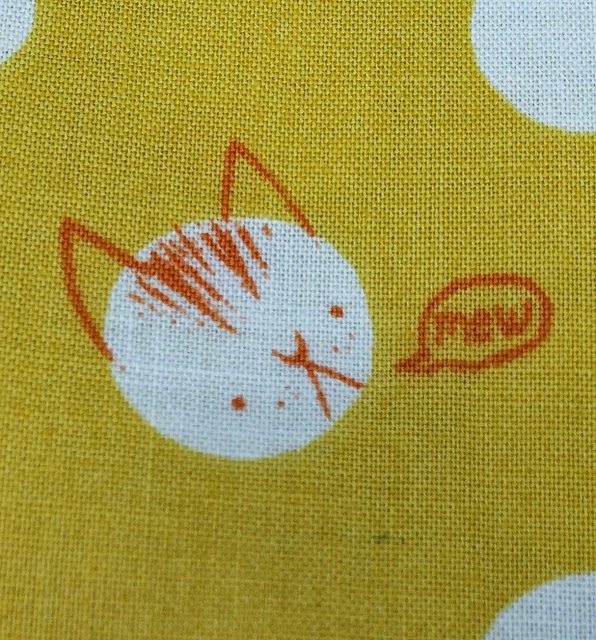 I want the kitty fabrics--"sew" cute. My favorite fruit is raspberries. My favorite fruit is blueberries, any way I can get them. My fave fruit is watermelon...or peaches...I can't pick! I'm a follower and let's be honest, I love all fruit. Just saw some other folks comments and kept saying, ooooh I like that too! I love strawberries! My mom called me The Strawberry Baby when I was a kid. My favorite fruit will always be cherries, I'm just waiting for them to come back in season! This giveaway is AWESOME, thank you so much! Like a bunch of the other commenters, I like most all fruit! But for TODAY, I'll say my favorite is...kiwi! I'm an email subscriber so I am going to come back and say that I also love grapefruit. There's never a bad time for one of those! I love blueberries! Thanks for the chance to win! Love all fruit but cantaloupe is my favorite. I love blood oranges. They're only available here for a short time every winter, and in that time I eat a TON. Thanks for the chance at some great fabric! Um, oranges. No, honeycrisp apples! No, kiwi! No, fresh cherries! Argh, it's too hard! Thank you for the great giveaway. My favorite fruit is strawberries. I had to start following you based on your profile pic alone... I now follow you via Blogger. And I also started following you (via Blogger) based on your amazing fabric selections. Gah! I love bananas! And Tula Pink. Hope I win. Thanks for the chance. Hi Rachel! Picking a favorite fruit is so difficult! I love Indian mangos - they're really different from what's available in most places in this area. Thai mangos are a close second. I follow you via Bloglovin'. How generous of you to give away all that OOP and HTF Tula! 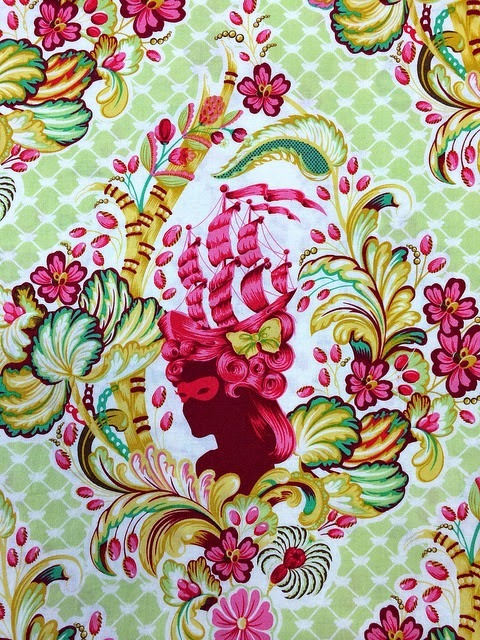 WOW, I'm a new quilter and I LOVE this fabric! Fav fruit, mango! All things mango! Bananas! Thanks for the great giveaway! following with bloglovin. Love strawberries too.